Some casinos have slight variations in their blackjack rules, but the following apply to most versions that you can play online. Use this Blackjack strategy chart that we give here in the beginning with all your games, and in time you will know “by heart” what to do in every given situation.But especially in the beginning it is handy and Smart to play purely by the strategies this chart gives. Even if you think that you should take the “change” and to gamble on the next card Stick to this and you will play the best winning practice! If the dealer is showing A, players can take out insurance against their having blackjack. This is an independent side bet that pays 2:1 and can be up to half the size of your initial bet. 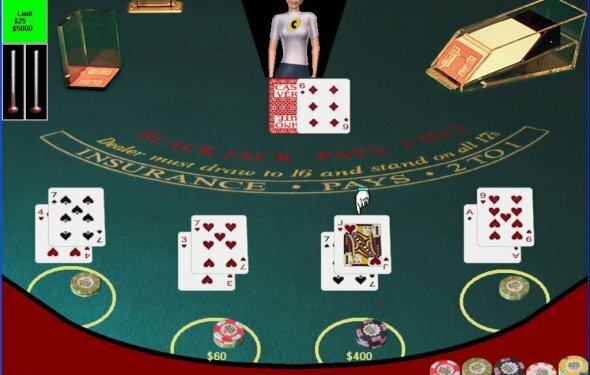 However, insurance rarely represents good value, as the limited size of the bet and potential win (at most, equal to your initial bet), is not offset by the low probability of the dealer getting blackjack. More often than not (probability dictates), you lose your insurance when the dealer doesn’t hit blackjack, and this lack of value is compounded by being able to lose your initial bet as well at the same time.